Let's go back in the Way Back Machine to our teen years. Think about what you wore. 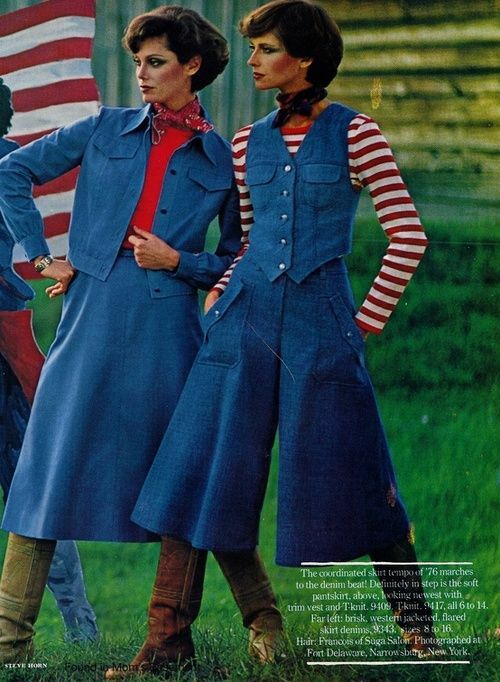 What was the biggest fashion don't of your teens? Mine was definitely gauchos. 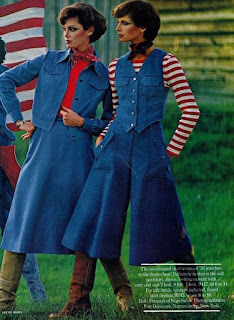 This happening style was basically knee length culottes with a lot of flare at the knees. They were typically worn with vests, as pictured above, and with a snug knit top or silky Qiana patterned blouse. Let me say that this was not a figure flattering look - on anyone! And yet I wore it anyway. I'm glad this was a short-lived fashion trend, and even happier that it has not been revived. Did you ever wear gauchos? What fashion don't did YOU wear in your teens? I'd love to hear from you in the comments, below. Gauchos were somewhat in when I was in high school, and I was so surprised to see they're back in trend! Not sure if I'll get on board with it, but it looks good on others.